Magic Leap has titillated the VR world by raising over US$1.5b and has been the subject of much discussion in the tech industry following a series of impressive demo videos the company has released, even as a number of articles cast doubt on whether the company’s commercial products will be able to live up to the hype that has formed around the secretive startup. AT&T’s apparent vote of confidence in Magic Leap—including Donovan’s personal relationship with the company—could serve to add heft to Magic Leap’s efforts in the sector. Magic Leap’s first “spatial computing” mixed reality headset, the Magic Leap One Creator Edition, is expected to ship this summer. However, despite the joint announcement, Magic Leap hasn’t confirmed an exact date or a price. Magic Leap has been slowly pulling back the veil on its headset. It recently revealed a few specifications on the headset; including a Nvidia Tegra X2 processor. The stream also showed an actual experience: a tech demo known as Dodge, where users have to dodge or block shots from a rock-throwing golem. The demo showcased how the Magic Leap One recognizes hand gestures, with users pinching and holding to place spawn points for the golem, or holding their hands up to deflect rocks. While it wasn’t shown here, it apparently supports multiplayer experiences sharing an illusion between people wearing headsets in the same space. 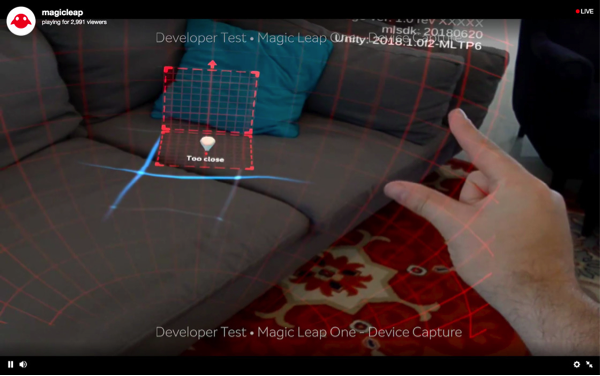 According to Magic Leap, the headset can pick up specific static gestures or identify points of the hand. However, the demo didn’t seem to recognize when a user’s hand should logically be blocking parts of the image, lessening the “mixed reality” impact. It also didn’t estimate the field of view from Magic Leap’s recording — an issue that has plagued Microsoft HoloLens videos.